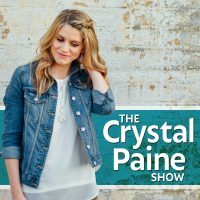 The Crystal Paine Show is dedicated to helping you embrace life right where you are and take practical steps to get where you want to go. Crystal says, "My hope is that this podcast will serve as an inspiration to your week, a pause in your day to slow down and reflect a little, a looked-forward-to part of your weekly routine, a place where we can connect on a deeper level… and ultimately, I my desire is that you come away from listening to each episode feeling motivated to bloom where you are planted and take intentional steps to move in the direction you are longing to go." Crystal is a wife, mom of 3, speaker, author, and online entrepreneur, best known for founding MoneySavingMom.com as well as YourBloggingMentor.com. Sign up for my free email list -- and never miss another episode!